I have opened my Adobe Digital Editions Library but I cannot locate the files that have expired. 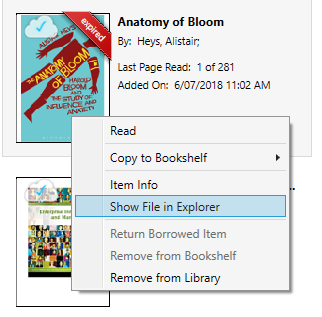 Before you download your textbook again, you should remove the PDF or epub file in the My Digital Editions folder from File Explorer. 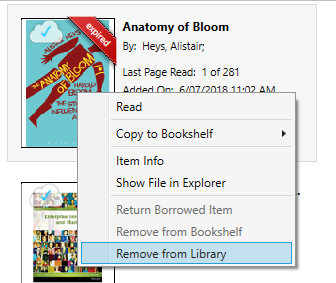 Choose All Items under Bookshelves from the left hand side menu, to view all the titles in your Adobe Digital Editions Library. Check that the highlighted file has the same title as the expired textbook. Delete the highlighted file/s in the My Digital Editions folder.